Lafayette, In: John B. Semans, printer, 1846. Octavo. 152pp. (Scattered spotting). Original half cloth and plain paper boards (covers rubbed, spine label damaged), cloth chemise, half morocco and cloth slipcase, spine gilt A very rare key overland guide, in very good original condition. 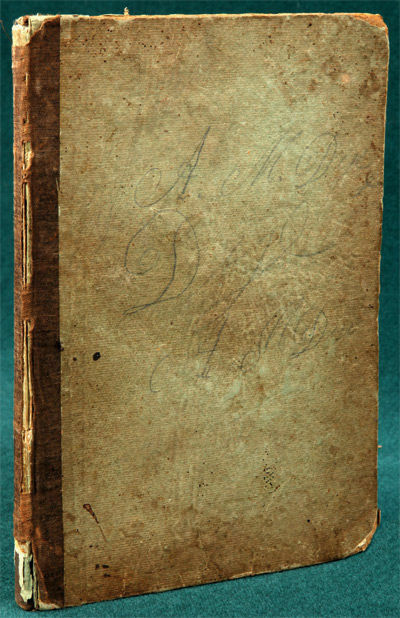 One of the earliest and rarest of overland guide books to the Oregon Trail, chronologically the second such guide, preceded only by the Hastings guide of 1845. The authors went overland to Oregon in 1843. Winter went to California the following year, then returned to Indiana, where he arranged to publish this guidebook in time for the 1846 emigrant season. The guide provides a detailed account of the 1843 trip, a long description of Oregon, Winter's route to California, the Bear Flag movement, gold at Santa Barbara, and of northern California. The return route from California is also described, and there is a table of distances in the rear. Winter eventually settled in the Napa-Sonoma area. This is the issue with corrected text on pages 26 and 36. A rarity, afforded a "d" by Howes, who calls it "one of the greatest of early overland narratives." A key guide and important work of Western Americana. Cowan I, p.315; Graff 2221; Howes J142, "d."; Sabin 36260; Streeter Sale 3145; Wagner-Camp 122. 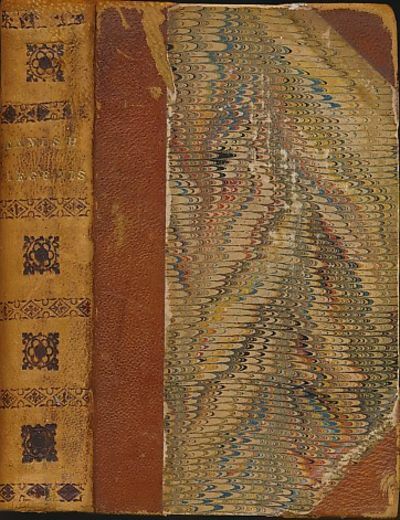 London: Bradbury and Evans, 1846. Blind-stamped, horizontal ribbed cloth. Gilt spine title. Title-page vignette on wood by Samuel Palmer. A clean, crisp copy throughout. Issue points include advert for "Oliver Twist" before the title-page, Gothic lettering of "The Reader's Passport", and 20th edition of "The Cricket on the Hearth" in ads at end. Small brown stain top of rear endpaper. See Smith II:7. 270pp. + 2-page adverts at front and at end.. First Edition. Blue Cloth. Minor Edge Wear/No Jacket. Octavo. Yerba Buena [i.e. San Francisco], 1846. Old folds. Near fine. In a half morocco clamshell case. A very early example of California cattle brands, the earliest trans-Mississippi brand record that we have ever encountered. The document is headlined: "Inspected the following hides & tallow for Mr. William Heath Davis with the vent marks." William Heath Davis (1822-1909) was born in Hawaii and settled in California, working first for his merchant uncle and then developing businesses for himself. He became a wealthy merchant, ship owner, and rancher, and was also an early settler of San Diego. The present document records the inspection of fifty-one hides and five bags of tallow belonging to Davis. In his memoirs Davis describes the process by which merchants received animal hides and tallow (the tallow being used for candles and soap) from ranchers in exchange for payment for goods. He also describes how merchants would race to collect their debt first, before the other creditors came to the ranchers seeking payment. It is likely that the present document was produced at an instance when Davis received a large payment of hides and tallow, which needed to be inspected for quality, quantity, and provenance. Significantly, the document reproduces the seven vent marks used on the hides. A vent mark was used by cattlemen to visibly quit their claim to branded cattle, usually by altering the existing brand, which by its nature could not be erased. Also inspected were five bags of tallow, and the four marks used on those bags are also recorded. The document is dated September 21, 1846, and is signed by E. Ward Pell, "Inspector General." 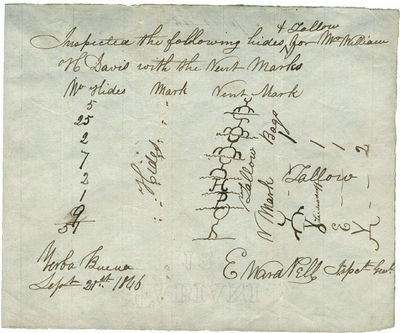 An early example of California cattle brands, and an interesting document illustrating the business operations of the important merchant, William Heath Davis. TRAVELS IN THE INTERIOR OF BRAZIL, PRINCIPALLY THROUGH THE NORTHERN PROVINCES AND THE GOLD AND DIAMOND DISTRICTS. During the Years 1836 -1841. Illustrated excursions in Italy. First and Second Series. First edition. Thomas M Lean. 1846. Two volumes. First and Second Series. Large Quarto. xii, 144, Appendix (4)pp musical notation, map, hand coloured in outline, 30 plates; (5), 45, (2)pp publisher's adverts., map, hand coloured in outline, 25 plates. Original publisher price label to fep, priced £4 - 4s. Original gilt and blind decorated green cloth, relaid to spine, showing wear. Variable foxing and spotting throughout. 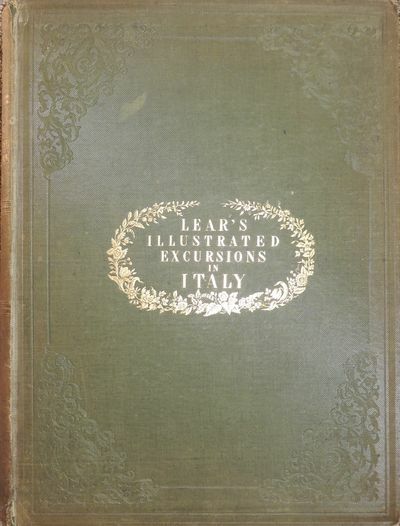 Illustrated Excursions in Italy is the largest, most magnificent of Lear's accounts. The first volume was published in April 1846, the second appeared the following August. Queen Victoria, one of the subscribers, was so impressed with the work that she invited Lear to give her a series of twelve drawing lessons; two examples of her work done under his tutelage are in the Royal Library at Windsor Castle. ODNB Abbey Travel 172. Provenance: from the Utterson Library. Neat signature of Edward V Utterson to fep dated 1846. Edward Vernon Utterson (1775/1776 - 1856) was a British lawyer, literary antiquary, collector, editor and founder of the Beldornie Press. Described by Bernard Quaritch as "a book-collector of real importance and high rank. He had taste, knowledge and experience". Elected a fellow of the Society of Antiquaries in 1807, he was one of the eighteen members who founded the Roxburghe Club at dinner at the St. Albans Tavern, St Albans Street, London, on 17 June 1812. Gunter's Prairie, Cherokee Nation, 1846. On a folded folio sheet. Old fold lines; remnants of wax seal and corresponding paper tear in a blank edge. Very good. A very interesting letter from George Washington Gunter, a member of the Cherokee Nation, regarding the sale of lands owned by his family in Alabama, and noteworthy for having been postmarked at Fort Smith, Arkansas in August, 1846 - a very early Arkansas postmark. George Washington Gunter was descended from John Gunter, a Scotsman who emigrated to America, married an Indian woman, and was admitted to the Cherokee Nation. George Washington Gunter writes E.A. Webster in Huntsville, Alabama, from his current home in "Gunter's Prairie, Cherokee Nation." He authorizes Webster to act as his agent in the sale of lands belonging to John Gunter, presumably in Alabama. It seems almost certain that these lands were abandoned by the Gunter family in 1838 when they were forced onto the "Trail of Tears" and relocated. Gunter instructs Webster to sell the land for not less than $500 and to look into whether Gunter has legal right to any other lands in the area. 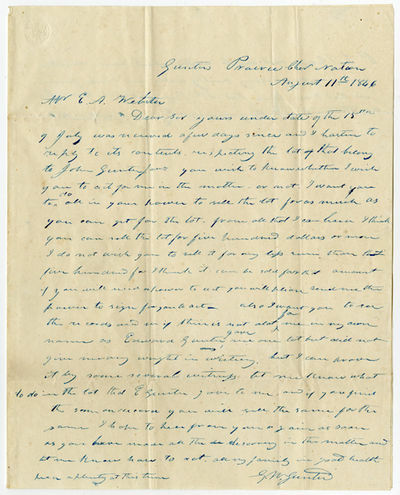 The Gunter family were close associates of Cherokee leader John Ross, and the postscript of this letter refers to Ross' negotiations with the federal government that culminated in the Cherokee Treaty of 1846: "I have not any to write about our country. We are getting along pretty well and I hope from all that I can learn that Mr. Ross will be able to make a settlement with the government. Die Heilige Schrift des alten und neuen Testamentes [in zehn Bänden] : Aus der Vulgata mit Bezug auf den Grundtext neu übersetzt und mit kurzen Anmerkungen erläutert Mit zur Seite stehendem lateinischen Urtext der Vulgata. // Biblia Sacra Vulgatae editionis Sixti V. Pontificus Maximi jussu recognita et Clementis VIII. auctoritate edita, nunc novissime ad exemplar Vaticanum expressa. ELIOT, George) STRAUSS, David Friedrich. The Life of Jesus, critically examined. Translated from the fourth German edition. 3 vols. Tall 8vo. Le Docteur Festus par R. Toeppfer. 5me edition. Bible. English. 1846. Authorized (i.e., "King James Version"). The illuminated Bible, containing the Old and New Testaments...With marginal readings, references, and chronological dates. Also, the Apocrypha....Embellished with sixteen hundred historical engravings by J.A. Adams, more than fourteen hundred of which are from original designs by J.G. Chapman. New York: Harper & Brothers Folio (34 cm, 13.4"). Frontis., add. engr. t.-p., , 844, , 128, , frontis., add. engr. t.-p., , 256, 3, , 8, 14, 34 pp. ; illus.. 1846 When the Harper firm published The Illuminated Bible near the midpoint of the 19th century, the company produced one of the most elaborate and costly American Bibles to that time. O'Callaghan says, "This work was originally announced in 1843, and was issued in 54 numbers at 25 cents each. J.A. Adams, the engraver, is credited with having taken the first electrotype in America from a woodcut. Many in this Bible are so done. Artists were engaged for more than six years in the preparation of the designs and engravings . . . at a cost of over $20,000." The title's use of the word "illuminated" refers not (as usual) to decoration in gold, but both to the huge number of illustrations and to the fact that the half-titles, the title-leaves, and the presentation and birth, death, and marriage leaves are printed using colored inks. Concerning the illustrations, Frank Weitenkampf wrote in The Boston Public Library Quarterly (July, 1958, pp. 154?-57): "The engravings after Chapman carefully reproduced the prim line-work method of the Englishman Bewick, introduced here by Alexander Anderson. . . . [T]his Harper publication was a remarkable production for its time and place, and retains its importance in the annals of American book-making. W.J. Linton, noted wood-engraver and author, knew ? 'no other book like this, so good, so perfect in all it undertakes.'" Binding, signed: Contemporary red morocco, cover panels deeply beveled, inside bevel framed in wide gilt roll with gilt-stamped corner decorations, spine gilt extra, turn-ins with beautiful, bright gilt rolls. Signed by Cook & Somerville of New York. 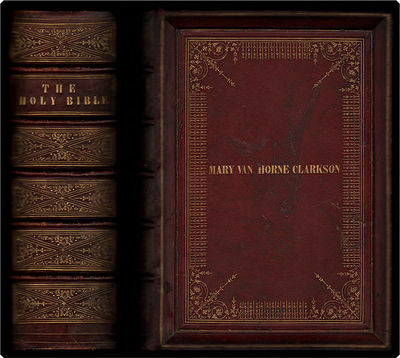 Provenance: Front cover gilt-stamped "Mary Van Horne Clarkson"; inscriptions of several members of the Van Horne Clarkson family, mostly in New York. 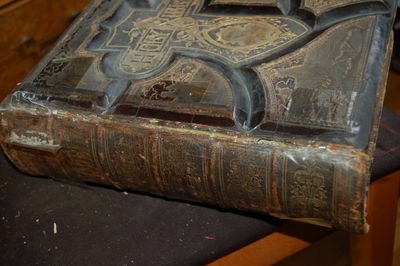 Binding as above, joints and extremities rubbed, covers with scrapes and discolorations but gilt still bright; repair to foot of front cover joint (hinged in place with appropriate papers; exterior secured with toned tissue), abraded leather consolidated. As might well be expected of such a massive volume, hinges and joints are tender. Occasional very faint spotting, pages generally clean, with family register leaves unused. Last (index) leaf with tear from inner margin extending into text, repaired with long-fiber tissue and wheat starch paste. => In its signed binding, this is an interesting example of a very impressive production. London: William Pickering. 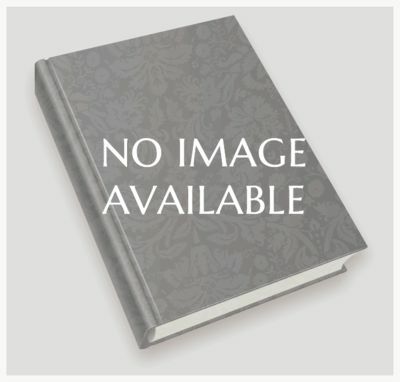 G : in good condition without dust jacket as issued. Covers rubbed with wear and scuffing to leather aling spine and corners. Spine worn. Previous owner's bookplate to fep. Sporadic light foxing within. 1846. First English Edition. Brown hardback half-leather cover on marbled boards. 160mm x 100mm (6" x 4"). 197pp. This first English edition comprising fourteen stories including 'The Wild Swans'; 'The Ugly Duckling'; 'The Little Mermaid' and 'The Emperor's New Clothes'. .
Beiträge zur näheren Kenntniss der Gattung Tarsius. Nebst einem helminthologischen Anhange von Dr. Creplin. Berlin, Georg Reimer, 1846. 4to. pp. x, 140, with 7 (1 handcoloured) lithographed plates. Contemporary green printed boards. B.M.(Nat. Hist. )I, 290. This interesting group of monkeys was first described by Buffon. The fine plates are by the author. Burmeister was a famous zoologist who published several works on the fauna of South America. Good with no dj. Scarce. Harper & Bros, 1846. Hardcover. Full leather. Folio, quite larger weighing over 13lbs with dimensions of 13 1/2 by 10 by 3 1/2 inches. Publisher's morocco with elaborate gilt framing, five raised bands with decorated panels.1600 engravings of historical and biblical scenes by J.A. Adams, 140 of which are original designs by J.G. Chapman. All edges gilt, dentilled pastedowns, marbled endpapers, double frontispiece with tissue guard, lovely typography. The binding is solid but the front cover is starting to separate from binding, the covers are clean with some chipping to spine crown, some rubbing, no markings inside, pages clean with light foxing to endpapers. Leather still supple. 1846 - ROBERTS, David. Original lithograph plate, Temple at Tafa in Nubia. [London: F.G. Moon, 1842-49]. Hand-colored lithograph on onionskin, measuring 9-5/8 by 13-3/4 inches, on original mount, measuring 16-7/8 by 23-3/4 inches. $2500.Beautiful original hand-colored lithograph of the Temple at Tafa in Nubia from the superb large format first issue of Robertsâ&#128;&#153; landmark work, Egypt and Nubia (only the first issue is hand-colored on onionskin and mounted on heavier card).Famed lithographer Louis Haghe produced splendid lithographs (including this print) of drawings Roberts made during his 1838-9 journey to Egypt, which were received with widespread enthusiasm when they appeared in 1846-9. â&#128;&#156;Among all the artists working in Egyptâ&#128;¦ [Roberts] stands head and shoulders above the rest, both for the number of sites and monuments he recorded and for his interesting presentationâ&#128;&#157; (Clayton, 6). â&#128;&#156;Hagheâ&#128;&#153;s skillful and delicate lithography, and his faithful interpretation of Robertsâ&#128;&#153; draughtsmanship and dramatic sense, combine in what are undoubtedly remarkable examples ofâ&#128;¦ lithographic works. Particularly in the Egypt and Nubia section, one feels that the colossal subjects and broad vistas were ideally suited to Robertsâ&#128;&#153; talentâ&#128;&#157; (Abbey, 341). Slight chipping and soiling to edges of mount; print slightly buckled. Overall, very good condition. 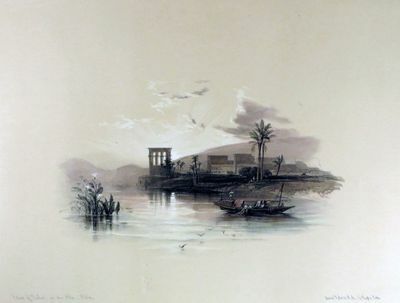 Exceptional hand-colored lithograph from the most famous and desirable work on Egypt. London: Short & Co., 1846. Poe, Edgar Allan (1809-49). Mesmerism ?in articulo mortis.? An astounding & horrifying narrative, shewing the extraordinary power of mesmerism in arresting the progress of death. 16pp. London: Short & Co., 1846. 213 x 138 mm. Without wrappers as issued; preserved in a cloth folding case. Light toning but a fine copy. Bookplate of American book collector Edward Hubert Litchfield (1879-1949). First Separate Edition of Poe?s gruesome short story on the occult ?powers? of mesmerism, originally published under the title ?The facts in the case of M. Valdemar? in The American Whig Review of December 1845. ?Poe plays with the idea that a dying person may be so imbued with magnetic fluid by a mesmerist that he can remain, although dead, in a kind of suspended death for months, until released by the mesmerist? "at which point his body immediately turns into a pile of stinking, putrid slime. Taking it to be factual, people seriously debated whether such a horrifying use of mesmerism was possible, and condemned it on the assumption that it was? (Waterfield, Hidden Depths: The Story of Hypnosis, p. 146). ?Mesmerism ?in articulo mortis?? was the last of three mesmeric tales Poe wrote in 1844 and 1845; although these works ?were essentially literary, it is also significant that these works were written in the style of scientific texts . . . 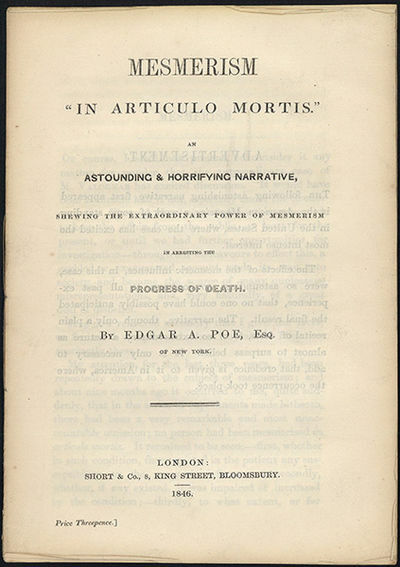 Although Poe?s intentions remain somewhat ambiguous, leading some critics to suggest that he may have actually attempted to perpetrate a literary hoax, it is important to acknowledge that these works were published and received as legitimate contributions to the field of science, and thus they offer insight into the assumptions and expectations of the scientific community? (Enns, p. 65). Enns, ?Mesmerism and the electric age: From Poe to Edison,? in Willis & Wynne, eds., Victorian Literary Mesmerism, pp. 61-82. Heartman & Canny, A Bibliography of the First Printings of the Writings of Edgar Allan Poe, p. 111. New York: Harper & Brothers, Publishers, 1846. 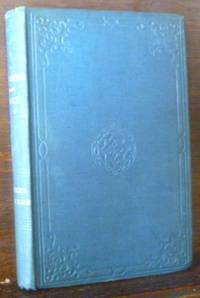 1st edition (Howes B-877; Jenkins, p. 84; Lone 2; Sabin 8658; cf. Hill 197, for the subsequent 1846 London edition). INSCRIBED PRESENTATION copy from the author, and dated in the year of publication. Original publisher's brown cloth with gilt stamping to spine & boards stamped in blind. Some wear @ the extremities, with board showing at the tips. Prior owner name stamp above authorial inscription. Usual bit of light foxing. Withal, a solid VG copy of this desirable book.. xiii, , 580, 8 pp. 8 page publisher catalogue at rear. Illustrated with a frontis, 12 full-page engravings (7 steel & 5 wood) & 20 intra-textual cuts. 8vo. 9-1/4" x 6" Browne's "... first book, and was written in large part to show what life was like on a whale ship, in order to better the lot of seamen. 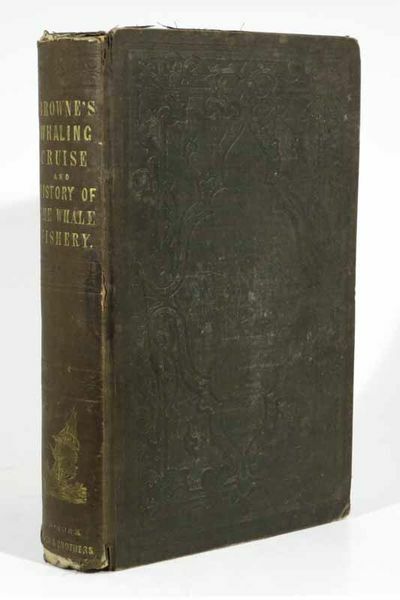 The narrative provides one of the few accounts we have of life in the whaling fleet of the 1840s, written by an intelligent and sensitive observer. Browne was influenced by Richard Henry Dana and, in turn, was imitated by Herman Melville." [Hill]. Inscribed copies of this classic work are quite uncommon on the commercial market; the last to come to auction was 1977. SALE, Major Gen. Sir Robert. London: published for the proprietor,, [c. 1846]. Drawn on Stone by W. L. Walton . Elephant folio (552 x 372 mm). Bound in publisher's green cloth, gilt titles to upper, neatly rebacked in green calf. With portrait, pictorial title, 5pp. text, lithographic dedication and 24 of the 34 tinted lithographic prints on 12 sheets, those remaining being the architectural elevations of Jellalabad and 2 of the Zenana under the hill at Shewukee. Without the map which some copies possess. Board edges bumped and cloth chipped. Portrait leaf chipped at edges (not affecting image), waterstaining to boards and text leaves, new tissues and endpapers. 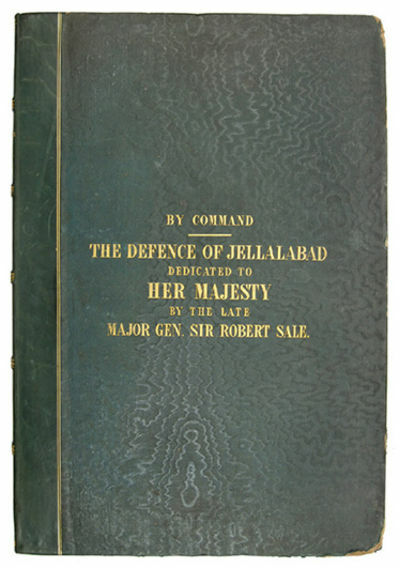 First edition of this pictorial record of the heroic defense of Jellalabad (later Jalalabad) under seige by Akbar Khan and his forces. Having been besieged for over two months, and with provisions running low, Sale "was determined to attack, and on 7 April moved out of Jalalabad in three columns...Akbar Khan's lines were carried and his camp, baggage, guns, arms, ammunition, and horses captured. Akbar fled towards Kabul, and the chiefs of the peoples in the Khyber direction hastened to submit to Sale. Württembergisches Wappenbuch oder die Wappen des immatriculirten Adels im Königreich Württemberg . Nebst einer heraldischen Beschreibung der Wappen und kurzen historisch-genealogischen Notizen. Mit 248 farbig lithogr. Wappen auf 117 Tafeln. Halle Ch Graeger 1846 - 64 Seiten und Tafeln, 4°, marmor. HLnbd. d.Zt. mit vergold. RTitel. Einband und Vorsätze im Fußbereich mit Spuren alter Feuchigkeitseinwirkung, sonst gutes Exemplar, die Tafeln in leuchtendem Kolorit. Paris Arthur Bertrand 1846 - A handsome copy bound in later quarter calf, raised bands. Occasional minor foxing. 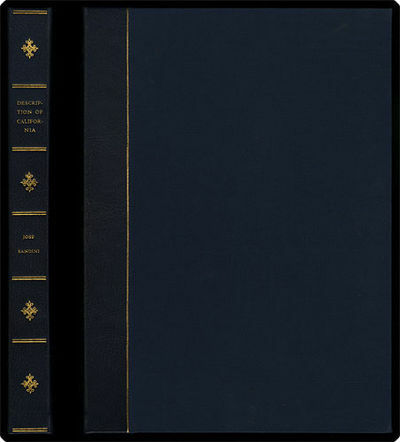 First edition Two volumes bound in one, 8vo, pp.xlviii, 406; [iv], 15 plates, large folding map. [Chicago, 1846. Dbd. Light soiling and wear. Good. 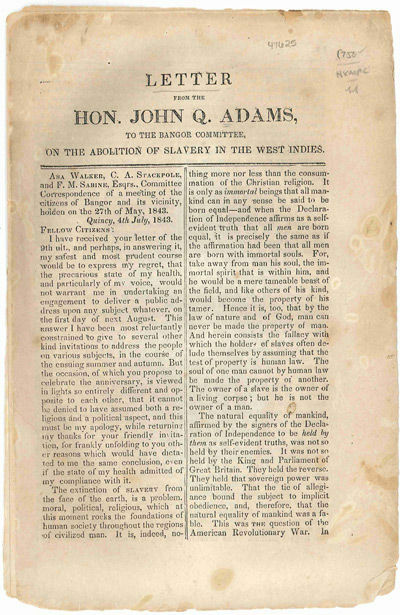 A scarce printed letter from John Quincy Adams to the anti-slavery committee in Bangor, dated July 4, 1843, followed by a report from the Monroe, New York DEMOCRAT about Adams' recent journey through the state. In his letter to the Bangor committee Adams declines an invitation to speak, citing poor health, but contributes a "strong blast at the institution of slavery" (Byrd). "The extinction of SLAVERY from the face of the earth," Adams writes, "is a problem, moral, political, religious, which at this moment rocks the foundations of human society throughout the regions of civilized man. It is, indeed, nothing more nor less than the consummation of the Christian religion" (p.). The letter first appeared in a regular issue of THE LIBERTY TREE (probably the December 1843 issue, according to Byrd) and was most likely printed separately (but retaining original pagination) along with other important documents from the first volume of that publication approximately three years later. THE LIBERTY TREE was a monthly anti-slavery periodical edited and published in Chicago by Zebina Eastman from 1843 to circa 1846. OCLC lists five copies: University of Chicago, Libraries of the Claremont Colleges, Abraham Lincoln Presidential Library, Brown University, and Princeton. [Washington], 1846. Engraved folded map by McLelland after Bruff, William A. Whitehead and Jacob Edmund Blake. In good condition except for some small clean repaired tears. Recent red morocco-backed cloth box, titled in gilt on 'spine'. A large, important, and informative map of Florida, one of the first produced after Florida's admission to the Union on March 3, 1845, carrying much useful military information. The map exhibits great detail and precision, especially in the coastline, and gives much information on the physical and cultural geography of the state. Numerous forts and military camps are located. This map would have provided important information on Florida at the onset of the Mexican War in 1846, in which there was much action in the waters of the Gulf of Mexico. Coastal islands are shown, as well as keys, rivers, and lakes. Great care is taken to note townships, pointing out which have been sectioned or unsectioned, and which have been surveyed or resurveyed. A note in the western Everglades marks the "district assigned to the Seminoles by the arrangement of Gen. Macomb May 18th 1839" and further remarks "N.B. 20 miles around this district is reserved from survey till the Seminoles are removed." The map contains three insets, showing "Key West;" "Mouths of the Suwanee River and the Cedar Keys Showing the Western Terminus of the Proposed Rail Road. From Lieut. 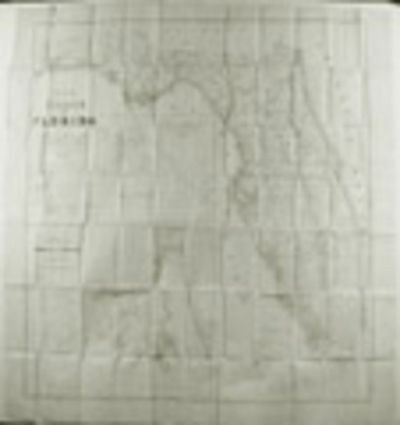 Blake's Map;" and "General Map of Part of Florida Included Between Cedar Keys and St. John's River. From Lieut. Blake's Map." Joseph Goldsborough Bruff was a civilian draftsman and artist with the Bureau of Topographical Engineers. He participated in the California Gold Rush, and also worked on the United States Capitol as an ornamental designer and draftsman. Bruff's earliest important map was issued by Henry S. Tanner in 1839, and was of the lands ceded by Indian tribes to the U.S. government by treaty, and lands occupied by the tribes. Bruff went on to produce important maps during the Mexican War (of the Isthmus of Tehuantepec) and the Civil War (of battles in Virginia and Maryland). Phillips Maps , p.284; OCLC 166643473. Philadelphia: H.S. Tanner, 1846. Copper-engraved map, on banknote paper, with original hand-colour. Good condition with some expert restoration to margins and old folds. 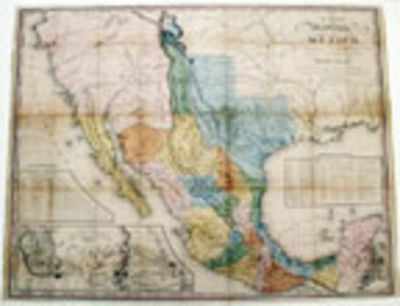 An important and rare map of Mexico and the southwestern United States, depicting Texas in its largest form, the 1846 "Second edition" of the celebrated Tanner map. The present map embraces all of modern Mexico and the southwestern United States of America, and prominently features the new American state of Texas with its original extensive boundaries. H.S. Tanner, of Philadelphia, was one of the most esteemed American mapmakers of the first half of the nineteenth-century. His 1822 Map of North America was one of the most influential of the period. In 1825, he excerpted and enlarged the portion of the map pertaining to what was a newly-independent Mexico, which then included the entire American southwest. Tanner's map effectively became the definitive source map for the region. It was brazenly copied in the White Gallaher & White map of 1828, which in turn directly inspired the famous Disturnell map of 1846, the "Treaty map" initially used to consider the redemarcation of the international border following the Mexican-American war. Walter Ristow noted that Tanner produced the first edition of the United States of Mexico map in 1825, and furthermore cited that he "issued 10 variants of one or another of five states" of the map up to 1847. The present map is officially termed as the "1846, second edition", although it is actually the seventh variant of the map to be issued, according to Ristow's classification. It closely follows the "1832, second edition," even including the "April 2nd, 1832" copyright imprint in the lower right corner. At this time, interest in all matters relating to Mexico and Texas amongst the American public was at an all-time high, and it is thought that Tanner hastily prepared this edition in order to capitalize on the commercial opportunities. Tanner did not take the time to avail himself of the most recent geographical advances, and consequently this map is a fascinating cartographic hold-out during a time of unprecedented change. Texas is portrayed as an enormous Mexican state, although it had since 1832 seceded, and later joined the Union as an American state. Its massive territory extends far to the north and west of its modern limits, following the eastern band of the Rio Grande up to its headwaters, up into the 'stovepipe' to a point touching the 42nd parallel. The geographical detailing of most of Texas is quite accurate, as Tanner was well apprised of Stephen F. Austin's surveys, a point underscored by his inclusion of 'Austin's Colony' in east-central Texas. In an improvement to it antecedent, the western portion of the state owes its form to William Emory's map of 1844. The depiction of what is now modern Mexico is quite advanced, in light of Alexander von Humboldt's exhaustive charting of the country. At this time, Tanner elected not to include information from Charles FrÃ©mont's ground-breaking map of 1845, based on his own discoveries. The coastline of Alta California still maintains a mythical quality, void of most actual details such as San Francisco Bay, but is replete with imaginary details such as the Buenaventura, Los Mongos, Timpangos and San Felipe Rivers. The interior regions extending all the way into what is now Colorado are shown to be almost completely unknown. A curious prophetic detail is the demarcation of a boundary line between Alta and Baja California, although located to the south of the international border that was to be set in 1848. The map includes a detailed inset depicting the key travel route from the port of Veracruz to Mexico City, the same path taken by U.S. forces during their successful attack on the Mexican capital in 1847. In the spirit of the times, the map also includes two statistical tables, one of distances and the other of population and geographical details of individual states. Tanner, wishing to update this map, produced a "third edition" later that same year that included FrÃ©mont's discoveries. Ristow A la Carte p.207; Wheat Mapping the Transmississippi West vol.III, p. 38. Le Menagier de Paris, traité morale et d'économie domestique composé vers 1393 par un bougeois parisien. Contenant des préceptes moraux, qq faits historiques, des instructions sur l'art de diriger une maison, des renseignements sur la consommation du Roi, des Princes et de la ville de Paris, à la fin du qua torzième siécle, des conseils sur le jardinage et sur le choix des chevaux, un traité de cuisine, fort étendu, et un autre non moins complet sur la chasse à l'épervier.Publié pour la premiere fois par la Société des Bibliophiles François. Manuscript on paper, in English. "Description of Upper California. [Monterey? Folio (31 cm; 12.25"). ff. (2 ff. wrappers, 2 ff. blanks, 10 ff. of text).. ca. 1846] The original manuscript of this 1828 report by José Bandini resides in the National Archive of Mexico and a near contemporary copy rests in the Cowan Collection of the Bancroft Library; both, of course, are in Spanish. Bandini, a native of Andulacia, Spain, who settled in California in about 1818, was a cultured, well-educated, and forward-thinking leader of the Californios, and he seems to have prepared his well-written and detailed essay for the new republican authorities in Mexico City in hopes of convincing them to aid the territory to grow and prosper, to the benefit of the Californios and the Mexican nation as well. He was also the father of Juan Bandini, of whom more later. The cataloguer at the Bancroft Library describes their Spanish-language manuscript copy in these terms: "Draft of report describing Alta California, its government, presidios, missions, Indians, settlements, ports, trade, roads, revenue, flora and fauna, and topography. With recommendations for its future development, notably the opening of the port of => San Diego to foreign vessels." The contents are clearly the same in this present translation, which was made probably between 1838 and 1846 from one of a few Spanish-language manuscript copies of the Bandini report that circulated in California in the 1830s and 1840s. Who made the translation is not known, but it is highly likely that it was made for Thomas Larkin (1802?-58), an early-arrived American settler in Alta California (April 1832), a signer of the original California constitution, and the first and only U.S consul to the California Republic. The information in Bandini's report would have been powerful ammunition in Larkin's reports to Washington encouraging American interest in California and its settlement by Anglo-Americans. Despite the importance of the information contained in Bandini's account of California in the period to ca. 1830, it remained unpublished until 1951, when the Friends of the Bancroft Library published a transcription of the Spanish and a translation into English. => This present translation remains unpublished still. Curiously, while Hubert Howe Bancroft was able to track down and acquired the manuscript history of California written by José Bandini's son Juan ("Apuntes para la historia de la Alta California desde el ano de su fundacion en 1769 hasta el ano de 1845"), he betrays no knowledge in his own history of California of José's work. Provenance: The Pacific School of Religion (properly released). Written in a clear secretarial hand on wove paper watermarked "Casa de Vall," using sepia ink, now faded but evenly so and still readable. Outer wrappers tattered and bug-stained. Document folded three times as to fit in a a pigeonhole storage box; paper somewhat relaxed and flattening, but still notably wavy. Now in a quarter blue morocco clamshell case. Peru. Reiseskizzen aus den Jahren 1838-1842. [Philadelphia] 1846 - He Fought with George Washington: Amazing Daguerreotype of a Revolutionary Soldier born in the 1740s. Hand-tinted quarter plate daguerreotype, blue paper mat, cased, contemporary manuscript laid over the case lining stating: &#147;Baltus Stone, Revolutionary Pensioner of the United States. Born October 1744. Signed his receipt for his Pension at the Philadelphia agency by making his mark. March 5, 1846. Aged about 101 ½ Years.&#148; This remarkable portrait of Revolutionary War veteran Baltus Stone is one of the very few daguerreotypes of a person who had lived in colonial America. Few Americans born before 1750 had their likenesses captured by the new medium of photography, which came to America in 1839. The precise date of Stone&#146;s birth is uncertain. The inscription in this case gives it as 1744, while his obituary gives the year 1743. Stone&#146;s pension application of 1820 states that he was then sixty-six, suggesting a birth year of 1754. The Copes-Bissett family Bible, which records the family of Stone&#146;s presumed daughter Hannah, gives the year 1747. In any event, Baltus Stone is one of the very earliest-born people to be photographed. The earliest competitor we have seen cited is a John Adams born in Worcester in 1745. Maureen Taylor&#146;s The Last Muster: Images of The Revolutionary War Generation (2010) reproduces portraits of only two men born as early as that decade, in 1746 and circa 1749. Another candidate is the African-American slave Caesar, with an uncorroborated birth year of 1737, whose daguerreotype is in the collection of The New-York Historical Society. Stone died just months after sitting for this daguerreotype. His October 1846 obituary states: &#145;The venerable Baltis [sic] Stone, well known in Southward [presumably Southwark, South Philadelphia] as the oldest inhabitant, & a veteran of Revolutionary times, died on Thu. Last. At an early age the dec&#146;d entered the army as a rifleman, along with his father, who sealed his devotion for his adopted country with his life&#146;s blood. Baltis Stone was with Washington in every campaign of the Revolutionary struggle, & witnessed the battles of Bunker Hill, Trenton, Germantown, Red Bank, & others, & yet escaped without receiving a wound. He has received a pension from Gov&#146;t, as a reward for these services, for many years. He was 103 years & 16 days old at his death. He was able to walk, supported by his staff, until within a few months past&#148; (National Intelligencer, 27 October 1846). Stone&#146;s official pension file reveals the obituary&#146;s embellishments. According to that file, Stone enlisted as a private in the Pennsylvania Rifle Regiment. He saw action in the Battle of Long Island (August 1776). Captured by the British, he was freed in an exchange at the end of his enlistment period. By late 1777 Stone had reenlisted as a wagoner&#151;possibly with Philadelphia&#146;s First Battalion, City Militia&#151;and subsequently saw action at Brandywine (September 1777) and Germantown (October 1777). Stone first applied for a veteran&#146;s pension in June 1818, after the passage of the Act to Provide for Certain Persons Engaged in the Land and Naval Service of the United States in the Revolutionary War. Stone was apparently required to reapply for his $8 per month pension in 1820, as the file also contains a deposition from that year. Stone declared at that time, &#147;I have no property of any description, am by occupation a day labourer, but from decrepitude and general infirmity am unable to labour. I have one daughter married with whom I reside and I am in such indigent circumstances as to be unable to support myself without the assistance of my country.&#148; This tremendous daguerreotype of an ancient Revolutionary War veteran virtually transports us to another era in the nation&#146;s history, before the United States of America even existed. Geschäftsbericht [Geschäfts-Bericht] der Direction der [Kurfürst] Friedrich-Wilhelms-Nordbahn (ab 1866: Bericht über die Betriebsverwaltung der Hessischen Nordbahn). 23 Geschäftsberichte für die Jahre 1844 (Gründungsjahr) bis 1867. Das Wesen und Treiben der Gauner, Diebe und Betrüger Deutschlands nebst Angabe von Maaßregeln, sich gegen Raub, Diebstahl und Betrug zu schützen und einem Wörterbuche der Diebessprache. London: F.G. Moon and Co., 1846. From the Standard Folio First Edition, limited to 500 sets only. A single original hand-coloured lithographic plate drawn on stone by Louis Haghe after David Roberts' paintings done on location in 1838. Printed on a half folio sheet 17" x 15", the captioned image, is 14" x 10", now presented in cream mounting boards 21" x 17" glazed behind clear mylar. Beautifully hand-coloured to the highest standards of the time. An example in excellent condition, clean, fresh, beautifully preserved. FROM One of the most desirable of all travel and COLOURplate books. A very beautiful image of the the Island of Philae from the Nile at Sunset. In the foreground are reeds and a sailboat, behind which can be seen in near silhouette the Temple of Isis on the island. Philae was accounted to be one of the burying-places of Osiris, and was held in high reverence both by the Egyptians to the north and the Nubians to the south. It was deemed profane for any but priests to dwell there and was accordingly sequestered and denominated "the Unapproachable." This is a view now un-viewable to modern eyes. Due to decades of constant flooding of Philae after the construction of the Aswan Low Dam every building was dismantled into about 40,000 units, and then transported to higher ground on the nearby island of Agilkia. The project was completed in time for the 1970 construction of the the Aswan High Dam. We have a good number of impressive images from the Standard Folio Edition of this classic work available for purchase. As well as many views of Egypt we also have available, views of Nubia, Petra, Sinai, the Jordan, Tyre, Sidon and Baalbec. Please inquire for further details. In the course of two and a half months in 1838, traveling some 800 miles south from Cairo, Roberts recorded the monumental temple sites along the Nile in more than a hundred sketches. As the first British artist to sketch the monuments of Ancient Egypt, set on "Plains so vast...that, until you come near them, you have no idea of their magnificence," Roberts was well aware of the stir his drawings would create in London. According to John Ruskin, writing in PRAETERITA, Roberts's drawings "were the first studies ever made conscientiously by an English painter, not to exhibit his own skill, but to give true portraiture of scenes of historical and religious interest. HONORE DAUMIER [1808Ð1879 ] French Artist. Les Gens de Justice. No. 22. 'Il defend l'orphelin et la veuve, a moins pourtant qu'il n'attaque la veuve et l'orphelin.